They are suggesting turning your toaster sideways to make grilled cheese sandwiches. Make sure the size of the cheese slice is smaller than the bread. For safety reasons! They say it works best with old and cheap toasters, not one of the newer models. • Toaster Bags - make lunch or snacks for you and your family fast, and keep your kitchen appliances clean! • Sandwich Toaster Toast Bags - to cook grilled cheese sandwiches quick and efficiently in your regular toaster. With no mess and no crumbs, your appliance will remain clean and the sandwich will retain its full flavor. Can be used to reheat pizza, chicken nuggets, fries and more. Large, non-stick, easy to clean and reusable. Milk jug to lunch box, ideal for breakfast or snacks. .... Pretty recycling! 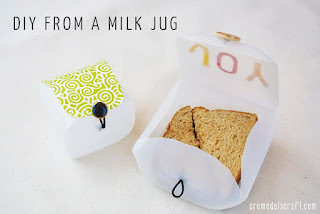 A milk jug makes a great lunch box, because not only is it food-safe, but it is the perfect size to keep your sandwiches from getting squished! I am not so sure I would send my child to school with this, but it is definitely a unique idea! • Nordic By Nature Sandwich and Snack Bags -- Made from cotton fabric and food-safe polyester which gives you the perfect solution to keep your food healthy, fresh and safe. Do you think you could make a bouncy ball with borax, cornstarch, white glue? Great idea as a solo project or as a group activity for birthday and other parties, after-school fun, summer projects and holidays. If you try it, let us know if it works? 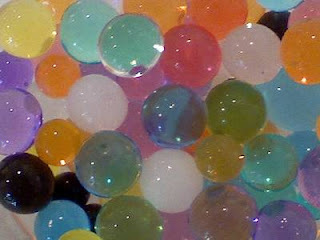 • Deluxe Bouncy Balls Craft Kit -- Everything you need to make your own bouncy balls! • Scientific Explorer Ball Blast Bouncers -- Great for rainy days and science class!